Below is a collection of Ghost stories related to Nottinghamshire Railways. Stories collected and attributed to John R Smalley, 1994. 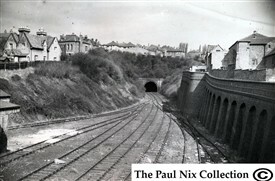 When a group of local businessmen collaborated to build Nottingham Suburban Railway (NSR) in the mid 1880’s, little did they realise their proposal line would turn out to be one of the Country’s great railway failures, or that one of its stations would play host to an interesting, if largely un-substantiated ghost story. 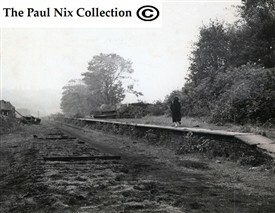 According to local lore, the site of the old Thorneywood station is haunted. The haunting is said to date back to the First World War when the line was used to bring back injured soldiers to local hospitals for treatment, and the bodies of the fallen for burial. Since that time, supposedly, strange things have happened in the deep cutting which once housed the station; especially after the line was abandoned in 1951, and usually after dark. Train smoke has been smelt, the ‘clanking’ of carriage couplings has been heard, and flickering lights have been seen near the old platform. Occasionally, and perhaps most spectacularly, a phantom train is supposed to emerge from the long-since bricked up mouth of Thorneywood Tunnel on dark stormy nights and thunder through the station bringing bad fortune to all who see it. An interesting bygone story of this comes from Mr D. Oakland, a former resident of St Ann’s. As a teenager in the early 1960’s, Mr Oakland was educated at Morley School, St Ann’s, a fact related to his encounter with the Thorneywood Legend. He reported: “The games lesson used to be held at the playing fields near Colwick Woods because our School had no facilities. We weren’t supposed to, but to get there we would use Thorneywood Tunnel as a short cut. We would scramble up the embankment to the railway bridge over the Wells Road, along the disused line, through Thorneywood Tunnel and out at Thorneywood Station. “One day we were about halfway through (the Tunnel was about 400 yards) when one of the lads said we were being followed. To be honest, we were worried because the Police kept watch to stop people from going in, and anyone from Morley School who were caught, would be expelled. Anyway, we kept looking behind but there was never anyone in sight. It wasn’t the sound of our own footsteps echoing in the Tunnel, but one chap swore we were being followed by a bloke. We stopped and hid in the Tunnel recesses to let him pass, only he never did. Eventually we stopped using it as a shortcut. “Sometimes we would mess about in other tunnels on the line such as Sherwood and Sneinton. But the other Tunnels along the line never seemed to bother us. Every time we entered the Thorneywood Tunnel we would become cold and an eerie feeling would loom over us all. There always seemed and still does seem to me, something sinister about Thorneywood Tunnel”. At shift change times, the railway companies used to run trains between the regular services to take workers to and from their depots. Amongst Nottinghamshire’s Great Central Men, this train was known as DIDI, because it ran Day In Day Out! Two railwaymen got off the DIDO at Bulwell Common Station to make their way home. They took the footpath across Bulwell Golf Course, one just slightly ahead of the other. One of them was briefly spoken to by a stranger. When the other asked what the stranger wanted, he was told the man just wanted to know the time. It all seemed normal enough until they both glanced back. The stranger had vanished, and there was absolutely nowhere he could have gone. Arkwright Street ran from Nottingham Midland Station to Trent Bridge. Part way along, a lattice-work girder bridge carried the Great Central’s line over the road towards Leicester and the South. That bridge was the site of a strange haunting. On a misty night in 1939, courting couple Mr X and Ms Z left a shop on Arkwright Street and walked towards Trent Bridge. Their route took them under the railway. As they approached the bridge, they heard someone walk briskly towards them. The couple stepped off the pavement and into the road to allow the hurrying pedestrian to pass. The mist did not prevent them seeing across the road and nearby street lamp gave sufficient illumination but, strangely, there was no one to be seen. The footsteps grew louder and their pace quickened but there was still no sign of the person. Eventually, when the couple were directly under the bridge, the sound of the footsteps passed them by, then grew softer as they disappeared into the mist of the evening. Two school children playing in the tunnel heard a steam engine rapidly approaching them – terrified they ran out into the fresh air. A few seconds after their escape they realised that the train could not have existed, as the north end of the tunnel was barricaded. This page was added by Joseph Earp on 05/09/2012. Too many ghosts and not enough railways now Joe.